Madhya Pradesh is decked with several tantric temples. Most of them were reportedly established during the reign of King Vikramaditya, ruler of Malwa region in Madhya Pradesh who regularly visited the tantric temples and worshipped the goddesses there to gain more and more spiritual energy and mental strength to conquer the enemies. One such temple is dedicated to Goddess Bagalamukhi situated in a small village called Nalkheda which is 90 Kilometer from the city of Ujjain. Universally it will be interesting note that except one or two Bhairava temples, all other temples which meant for tantrics and sadanathviks to attain yogic and siddha power and energy belong to female deities. Bagalamukhi is one of the ten deities propitiated to gain tantric power by the sadanathvik. She is the eighth Devi out of ten Devis in Mahavidya also called Dasa Mahavidya a tantric ritual in which ten aspects Goddess Parvathi are represented in the form of feminine divinity from compassionate soft nature goddess to fiery goddess. World over only three temples exists for Goddess Bagalamukhi. Bagalamukhi means Crane faced. This temple is considered to be one of the Sakthi Peeda and situated on the banks of river Lakundar, a tutelary river of river Narmada. The greatness of the temple can be gauged by the fact that it is surrounded from all the four sides by cemeteries and burial grounds. Nowhere in the world has any temple exists in such a landscape. Perhaps this could be one of the reasons why the temple has enormous tantric powers because generally it is believed that several souls -both divine and human- wander over the cemeteries and burial grounds and they are under the total control of this devi here. The scant history of the temple can be read in a small culvert enshrined in the temple. However most of the details on this temple are word of mouth stories as told by the temple priests and other villagers floating for generations as their predecessors belonged to the same village. But there are some references of this Goddess in the sacred texts too. How did Goddess Bagalamukhi manifest? As per one of the folklores, once during Sat Yuga a terrific storm and deluge erupted which threatened to destroy the entire creations in the Universe. Unable to see the destruction happening in front of him, Lord Vishnu protector of the Universe in a helpless state went to an isolated location in Saurashtra region and sat in severe penance praying for welfare of humanity. When he sat in penance, a huge ball of fire like flame rose from his navel, travelled upwards and mingled with the light rays of the stars. When it mingled with the light rays of the stars over the sea in Haridra Sarovara, a female deity clad in yellow dress appeared from the joint flame and went before Lord Vishnu to inform him that she was Goddess Bagalamukhi, manifestation of Parasakthi sent by her to save the mankind from destruction. Assuring him that she would end the fury of nature she immediately acted to her word and with her power calmed down the fury of the storm and deluge by absorbing them in her. The storm and furious turbulence in sea stopped instantly and creations were thus saved from destruction. Lord Vishnu realized that Goddess Parvathi from her energy has indeed created Goddess Bagalamukhi and sent her to destroy the evil forces in the universe that were destroying the divine and spiritual atmosphere which has caused the crisis emerged then. Thus Goddess Bagalamukhi manifested. The folklore continues to tell us how the temple for Goddess Bagalamukhi came up in Nalkheda on the river bank of Lakundar. During Mahabharata war, the Pandava brothers visited many tantric temples to gain yogic powers with magical properties to get back their lost pride by attaining victory in the battle with Kauravas and thus they visited this temple site too to pray Goddess Bagalamukhi as advised by Lord Krishna who guided them to visit here. When the Pandava brothers visited this site there was no shrine and only the present shaped statue of Goddess Bagalamukhi was found under a tree. Lord Krishna was well aware that Goddess Bagalamukhi after manifesting in Saurashtra came and stayed underground there and therefore he compelled them to visit the site since Goddess Bagalamukhi first revealed herself to Lord Vishnu only, who incarnated as Lord Krishna for some cause. Heeding to the advice of Lord Krishna the Pandava brothers stayed here for some time praying Goddess Bagalamukhi to bestow them enormous yogic powers with magical properties to win the battle and to regain their lost empire. They remained there and prayed for several years when they were finally bestowed with the boon they sought. During their stay Lord Krishna advised Yudhishtra to construct a shrine for Goddess Bagalamukhi before departing from the place. Since there was no shrine and only the statue of Goddess Bagalamukhi was found under the tree, Pandava brothers built a small mud structure and enshrined the Devi with Vedic rituals. Thus though a temporary structure in the form of a shrine was first built by the Pandava brothers, over the period of time the temporary structure underwent several changes and shapes due to natural calamities and events, but not the statue which remained unaffected and remained in the same place so claim the pundits. Since Mahabharata war took place several thousands of years ago, the devotees claim that this temple is also several thousand years old. The present day temple priest belonged to the tenth generation of a family who were maintaining the temple and performing rituals and Pooja even though it is under the govt, being the most ancient temple. Several saints and sages visit this temple and perform rituals and yagna to gain tantric and spiritual power besides yogic powers with magical properties. To appease the Goddess they are advised to wear yellow dress while performing the rituals and worship. They also wear a chain on their neck made of turmeric beads. Appearance and features of this mystic Goddess Bagalamukhi are also found in some of the sacred texts. She is described as Devi with three eyes, golden in complexion, always appear in yellow dress. In the midst of an ocean of nectar, with yellow champak flowers floating all around, the Goddess is seated on a golden throne with a crescent moon adorning her head gear while one of her hand is pulling the tongue of a demon. The statue of the mystic Devi appears with three faces with three eyes carved out on one single stone. She has reportedly manifested of her own in the form of a statue from the ground below the temple so goes the folklore. 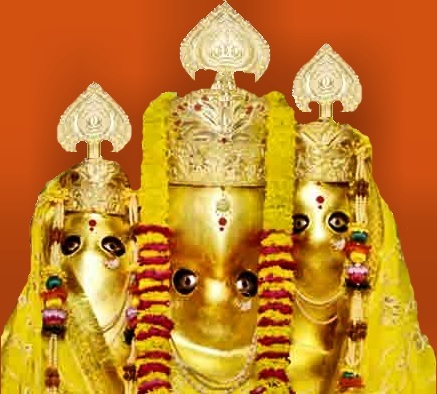 Some say that the three faces of Goddess Bagalamukhi represents the tri-deity powers of Goddess Lakshmi and Goddess Saraswathi by way of two faces one each on each side while the main face in the centre is that of Goddess Bagalamukhi an emanation from Goddess Parvathi. Some other pundits however give a different version claiming that when Goddess Bagalamukhi was created by Goddess Parvathi she was given the enormous powers from the three eyes of her consort Lord Siva to destroy the evil forces. Hence the three faces and three eyes represent the three enormous energies inherited by Goddess Bagalamukhi to perform her task. The sanctum of Goddess Bagalamukhi has fourteen pillars which are claimed to be imbibed with mantra and tantric power of the devi and they keep releasing the divine power energies of Goddess Bagalamukhi from all sides and those who perform sadana in the temple are able to absorb those energies to gain tantric power. Even those who regularly visit the temple to offer prayers and worship are charged with those mystic energies; hence no evil forces are able to attract and harm them in any manner, so claim the devotees. If someone with cussedness comes to this temple to gain tantric powers to cause devilment they will only meet with failure. Only those Saktha who desire to gain tantric powers for good cause will be successful in attaining the power says the pundits here. While the historians and researchers opine that the statue is as old as 2500 years, the spiritual masters dispute the opinion to claim that the same is several thousand years old and Goddess Bagalamukhi had manifested there even before Mahabharata war since Lord Krishna and Pandava brothers visited here and prayed her seeking victory in the war. Recitation of Bagalamukhi Mantra is believed to have miraculous powers to ensure victory over enemies. 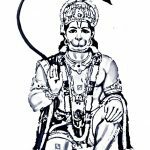 Since the deity is identified with controlling the power of speech, those in management, politics and in legal profession chant Goddess Bagalamukhi mantra to win over their enemies. Similarly those appearing in competitive exams, debates, etc too worship this devi for success. She is believed to smash the misconceptions and delusions of her enemies and protects them from their enemies. Goddess Bagalamukhi ward off the effects of evil spirits and evil eyes because she is a tantric deity, eighth in the Tantric ritual Mahavidya also called Dasa Vidya. There is an interesting tale connected to her appearance in the temples holding the tongue of a demon. A demon called Madan undertook severe austerities and obtained a powerful boon called Vaksiddhi i.e power of speech, with which he was able to stop anyone’s’ chant, from anywhere by counter uttering anything he liked. But there was a rider in the boon which he himself was unaware. 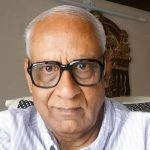 As per the rider class, if the power to speech of demon Madan is stilled for any reason for even few seconds, then the power of Vaksiddhi will go away. Once boon received, in freakish behaviour he began stopping the Yahyas and Homa ceremonies by blocking the mantras chanted in them besides harassing mankind and Devas by abusing the boon Vaksiddhi. It was sadist pleasure for him. Unable to bear the torture, harassed forces from Devaloga prayed Goddess Bagalamukhi to save them from his atrocities. At the same time other human forces in universe too prayed to Goddess Bagalamukhi to save them from the tyranny of demon Madan. 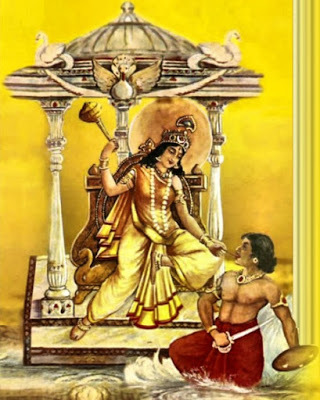 Angered by the unruly behaviour of demon Madan which caused innumerable suffering to everyone in Devaloga as well in Universe, angered Goddess Bagalamukhi waged a battle on demon Madan and during fight quickly held his tongue stilling the power of his speech and pulled out her weapon to kill him. Once his speech was stilled he lost his entire powers. Before he was killed however, he was quick to apologize for the mistakes and requested that the Goddess should accept the worship and Puja of her devotees in the same appearance and she relented to his request. It is not without reason that his request was heeded to by the compassionate Goddess. Several years ago before he met his death demon Madan was one of the deva ganas serving Goddess Parvathi wherever she went. Pleased with his sincere service Goddess Parvathi always admired him because of which he commanded good respect amongst the deva ganas and others in the universe. 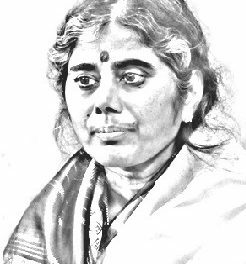 One day while Goddess Parvathi was meditating, unaware of her presence inside, the deva gana began to chant something in loud voice, disturbing Goddess Parvathi’s meditation. When her meditation was disturbed annoyed Goddess Parvathi cursed him that he will take birth as a demon and his power of speech will be the cause of his death in the most shameful manner. When the Gana pleaded with the Goddess to pardon him since the act was unintentional, she modified the curse to state that his power of speech will be the cause of his death but the death will also occur at the hands of one of her own emanation after which he will join her again. When he got birth as demon Madan he had to meet his death at the hands of the Goddess Bagalamukhi the emanation of Goddess Parvathi who stilled his voice and choked him to death. 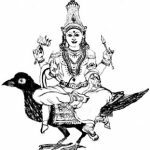 However since demon Madan in his previous birth served Goddess Parvathi in all sincerity, she accepted his death wish to appear in the same posture, Goddess Bagalamuki pulling out the tongue of demon Madan while being worshipped. Thanks for the article. I have been searching much about Devi Baglamukhi a lot lately. 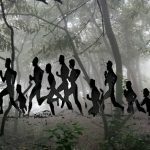 As my fate would have it, or not, I have been under the influence of some muslim tantrik black magic for probably about 20 years now, or so have been told to me by people of spiritual inclination over and over again. Perhaps it was done by a female relative of mine. I have been thinking over and over again whether Devi Baglamukhi puja/yagya is the most potent solution against any and all evil practices? If not, then what is? Pray to Devi Bagalamukhi to nullify the evil effects on you by lighting a Cow ghee lamp (lamp made of mud or clay by pottery and not metallic lamp) in front of her photo. That would automatically drive away evils if influenced on you. Best wishes.